We have a mole in our unit. Well, we think it’s a mole. It could be any other type of burrowing rodent, but it’s probably a mole. We’ve known our unit was inhabited since the day after we began it; because we arrived to a neat little hill of dirt on the floor and we know that we swept everything clean the day before. I can’t imagine what he, or she, thinks is going on. Each day we dig a little deeper and expose one or more of the mole holes. 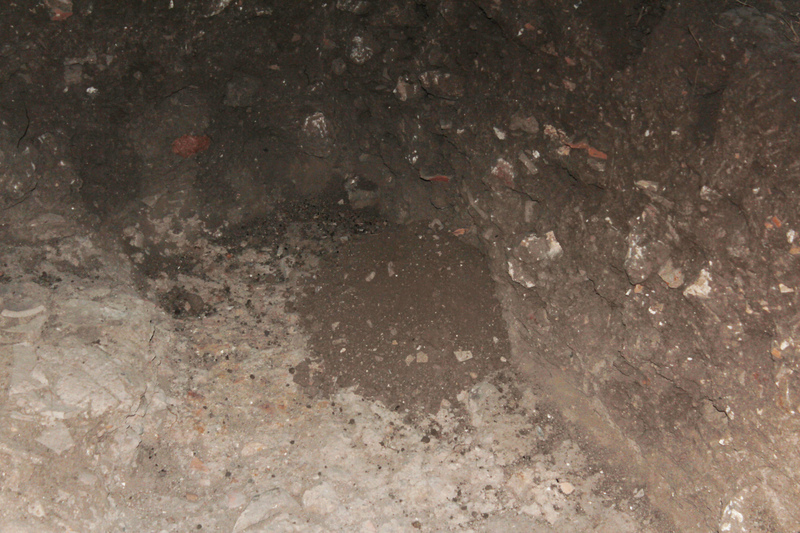 Most are found when we remove a rock and there is suddenly a hole in the ground. One day last week, we dug into the mole’s nest. Well, we didn’t dig into it initially, someone walked across it and the area collapsed about an inch and there was all this stuff — straw, plastic, seed, weird insects and grass. Not much of a home to me, but I’m sure to the mole it was everything necessary. So of course we dug it out and removed it. Frankly, it was nasty. We didn’t see any indication of the critter for a number of days and then a few days ago we left the unit in pristine shape and went to breakfast. We eat breakfast on the tel, so we weren’t really that far away. About a half hour later, we came back to a real skunkworks. There were four little mounds of dirt in various parts of the unit. As we watched, we saw little paws and perhaps a nose pushing dirt out of a hole in the middle of the unit onto a pile of dirt. We just stood there. It seemed a shame to disturb such industry, but we needed to get back in and dig some more. So we cleaned up the mess and dug on. We have not been back to the site since this happened on Friday. Monday we will return and I have a feeling, we will see little piles of dirt in the unit. This mole is persistent if nothing else.